Splash pages, you gotta' love 'em. A blank canvas where the artist can hit the reader with a large dose of illustrated 'wow'. This Friday, a splash by horror illustrator extraordinaire Berni Wrightson, featuring the incredible 80's icon that is Swamp Thing. You know in all this time of doing Now That's A Splash Page - this is the first actual splash page. I figured with Valentines Day around the corner I needed something a little darker to line my stomach. 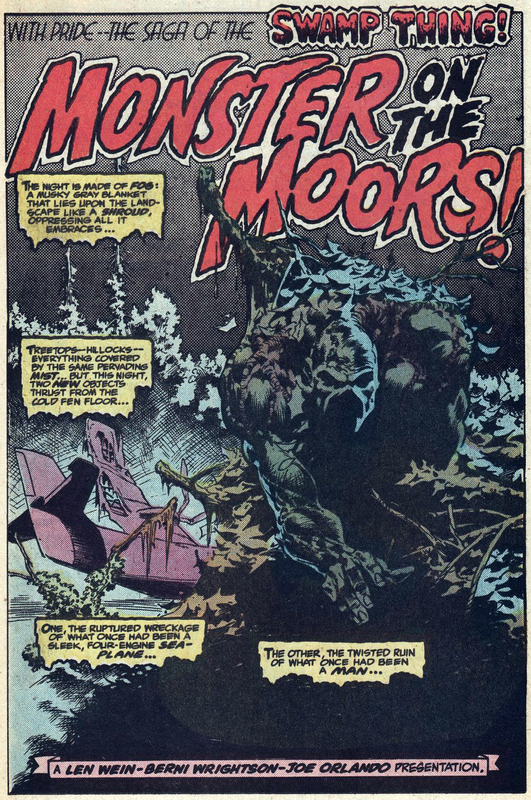 Berni's art on Swamp Thing was amazing, he really did bring the natural beastie to life. Plus look at that good old fashioned pulp typography roaring in the background as Swamp Thing emerges from the wreckage. Modern type and lettering is all good, but the old school looking fonts just makes a comic feel like a comic should. YES! classic Swamp Thing. i love Berni Wrightson's art. he has this way of drawing Swamp Thing as well as other characters so that you can almost see them moving even though they're still pics. but he doesn't do it in the same as say artists like Mike Golden or Sal Buscema who express action and movement often with a lot of energy. Berni Wrightson's style is more slow moving i dare say lumbering but dynamic in it's own way. plus he has a great eye for the use of light and shadow. how ironic that Valentine's Day is right around the corner since the Swamp Thing was in part inspired some heart ache that either Wein or Wrightson were going through when they came up with the concept together. Thanks for those awesome comments Dave - yeah I figured this blog needed a bit more Swampy. Like you say though he actually fits the run in to Valentines Day more than I thought, because he really is a story of Beauty and the Beast at heart. Oh well next year I'll get it right! Wrightson was so good at splash pages - another of my favorite comic book elements. This one is fantastic, as is the issue itself. Hey AM glad you liked the post. You run a great blog. as soon as I get my net back this week after house repirs are done I'll add a link to it on IADW!